The weather at Shadow Cliffs has been very nice with the temperatures in the low 60 to the low 80. Water Temperature: 75 degrees, depending on depth. On 8/12/17, Brook Van Muije was float tubing near Island Pond when he caught and released 6 bass, the largest was 6lbs. On 8/13/17 C. Brown of Alamo was float tubing in the Arroyo ponds when he caught 7 bass, the largest was 5lbs. 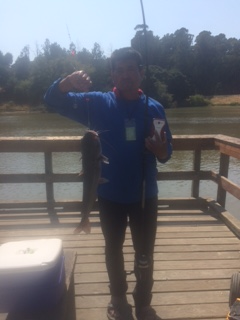 Anglers report fishing from the shore has slowed down but some boaters are still catching limits bait fishing with livers.